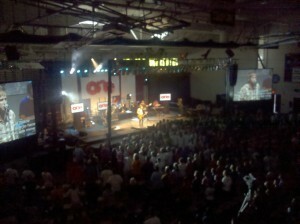 GraceConnect » Momentum Youth Conference Begins in Pa. Momentum Youth Conference Begins in Pa.
Jeremy Byng leads opening night worship at Momentum, the annual Grace Brethren youth conference, which is being held in Johnstown, Pa. Momentum, the annual Grace Brethren youth conference, kicked off last night in the Sports Center at the University of Pittsburgh, Johnstown, Pa., with rousing worship led by Jeremy Byng and a challenge to proclaim the good news of Jesus Christ by speaker Greg Speck. Hundreds of students and adults have gathered from around the country for the week, which is hosted by CE National and co-sponsored by Grace College, Lancaster Bible College, Go2 Ministries, and Grace Brethren International Missions. This morning, Mark Cahill, author of One Thing You Can’t Do in Heaven and One Heartbeat Away, encouraged the students to be bold in sharing their faith. “How do you not know God has placed you ‘for such a time as this? '” he said. After Power Trax, a series of workshops on a variety of topics, and lunch, the afternoon is free for students to be involved in sports tournaments, Bible quizzing, service projects, and other recreational opportunities. Tonight, Jim Brown, pastor of Grace Community Church, a Grace Brethren church in Goshen, Ind., is the speaker. Aaron Keyes will lead worship. Follow the days events at http://history.buildmomentum.org/conference2011/ or view photos and reports on Facebook. You may also follow Momentum 2011 on Twitter at twitter.com/LiveAtMomentum. The conference continues through Saturday night.